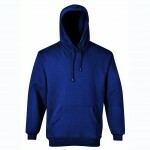 Lined hooded sweatshirt with drawstring. Cuffs and bottom hem in 1x1 rib with elastane. 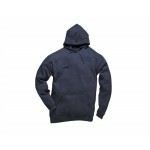 Front kangaroo pocket with reinforced seams. Topstitching flatlock on shoulders, armholes and bottom hemline. Modern cut. Tubular construction.